Engineers worked through the night to prevent a repeat of gridlock which occurred on the opening of Northampton's £7m bus interchange. Problems started from about 11:00 GMT on Monday with buses left at a standstill and queues of passengers. Northampton Borough Council said the "teething problems" were because of traffic light "phasing" and increased traffic. It worked with county council engineers overnight to change the road layout. Changes included new yellow box junctions, a new road layout at the junction of College Street and Bradshaw Street and banning cars, except taxis, from Drapery Street. Northampton Borough Council said that pedestrians "crossing the Drapery and Sheep Street against the traffic signals" and "the phasing of the traffic lights on Bradshaw Street and the Drapery" helped cause "a sudden increase in traffic" on Monday. The council's leader David Mackintosh said: "The very difficult situation we faced happened very suddenly. 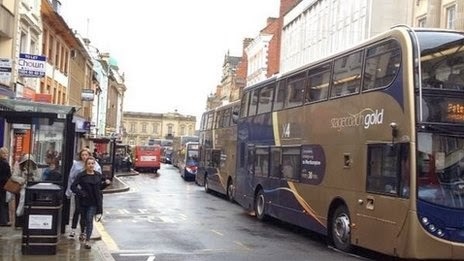 "I know that buses are vital to our town and it is absolutely critical we get it right." He added that Northamptonshire County Council engineers had been on site all morning "ready to respond if things begin to go wrong". The centre of Northampton had been left in gridlock and the police brought in to manage traffic after the opening of a new £7m bus interchange. Problems started from about 11:00 GMT with lines of buses at a standstill and queues of passengers building up. Well, what went wrong here. Did anyone predict these problems? We live a tremendous technical age where traffic can be predicted and controlled by clever electronics. 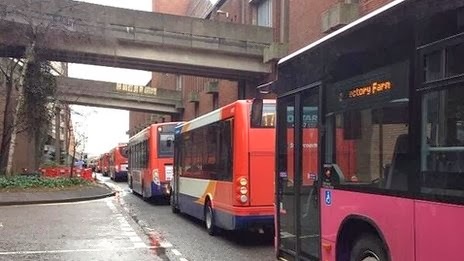 The problem is if people of the wrong calibre are involved in the initial design and construction of bus interchanges and road layouts and don't look in detail at the "what if" situations, we end up with buses and other vehicles in gridlock. Presumably none of the highly paid people who have been involved in this scheme ever realised that it would happen. They won't loose their jobs and will maybe even get promoted for their efforts. It's a strange world isn't it. If you have personal experience of this fiasco and any pictures please feel free to share with us.